Van Helsing: She is Nosferatu! Mel Brooks really made a classic when he satirized the classic Universal Frankenstein series in his 1974 gem Young Frankenstein. The affection and madcap humor of that film made it much-beloved. 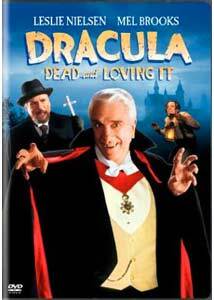 This followup over 20 years later tries to do the same for the Dracula series with mixed results. Renfield (Peter MacNicol) goes on a business errand to the castle of Count Dracula (Leslie Nielsen), a clumsy vampire who has designs on buying Carfax Abbey in England. With Renfield firmly ensnared by hypnosis (without much effort), Dracula sets up shop in Britain and pursues young Lucy (Lysette Anthony) and Mina (Amy Yasbeck). But he doesn't count on the interference of vampire hunter Abraham Van Helsing (Brooks himself). Although the outline of the story is stripped directly from the 1931 Dracula (and the source play by Hamilton Deane), many of the visuals (particularly Dracula's ridiculous wig) are borrowed from Coppola's Bram Stoker's Dracula. Eschewing the black-and-white photography of Young Frankenstein, Brooks also gives the proceedings a gaudy color splash reminiscent of the early Hammer Dracula films. That's put to best use in a satire of the blood gushing involved in the process of staking, as poor Steven Weber gets drenched while Van Helsing safely hides behind a pillar. Like the Hammer films, the production values are lush (other than the intentionally cheesy effects work) and the lighting and camera work are gorgeous, which deepens the satirical appreciation. There are also borrowings from Murnau's Nosferatu, such as a comic take on the pivotal scene of Orlok rising bolt upright from his coffin. As has unfortunately been the case in most of Brooks' films in the last few decades, the laughs are pretty forced. The story is played pretty much straight with pratfalls stuck in, and none of the inventiveness of the Frankenstein satire is apparent here. The biggest laugh comes from an extended cameo by Anne Bancroft as Ouspenskaya, a gypsy woman, surreptitiously borrowed from The Wolf Man, with an oddly quavering voice. Peter MacNicol, who excels at twitchy characters, makes for a first-rate bug-eating Renfield. Nielsen can both play straight and comic with aplomb, and his Dracula is fairly entertaining, and his timing is still very sharp. He has some particularly good bits when his mental control powers prove far too powerful and plenty of unintended consequences result. Brooks' characterization of Van Helsing is most notable for his trademark use of a funny voice, but doesn't offer much beyond that. Harvey Korman's Dr. Seward has a typically 19th-century fondness for enemas as a cureall that makes for a good running gag. The main problem is that the film hews too closely to the straight Dracula story, without departing in enough funny directions. It's good for a few chuckles, but other than Bancroft's scenes presents little in the nature of laugh-out-loud humor. Some sequences, such as an extended dance between Nielsen and Yasbeck go on way longer than they should, resulting in too many patches of just being dull. But oddly enough, not only does it hold up on a second viewing, but I also found it funnier; there are quite a few subtleties, particularly in Nielsen and MacNicol's performances, that are more entertaining than the actual gags. Image Transfer Review: The anamorphic widescreen picture looks quite nice in general, with excellent, brilliant color and vivid detail. Artifacting and edge enhancement are seldom visible. There is slight speckling throughout, which is surprising for such a recent film. There is a problem at 34m:14s where the image suddenly brightens substantially, washing out the black levels. That lasts for less than a minute but is distracting when it happens. Audio Transfer Review: While the Dolby Surround track is quite clean and crisp, there's not much in the way of clear directionality. During the storm at sea, however, it really shines with a lively surround quality that features deep bass and vivid immediacy. A very nice track just a notch below a first-rate 5.1. Extras Review: In addition to an anamorphic widescreen trailer that includes all the best bits of the movie, there's also a commentary by many of the principals. There are a few dead spots, but overall it's pretty good, with comments on the techniques of parody and the technical choices that were made in creating the film. It's not earthshaking but worth a listen. Mel Brooks' take on the Dracula story is given a beautiful transfer and a decent commentary, but it's short on actually being funny. Worth a rental for Brooks and Leslie Nielsen diehards, and it actually has a pretty good replay value.